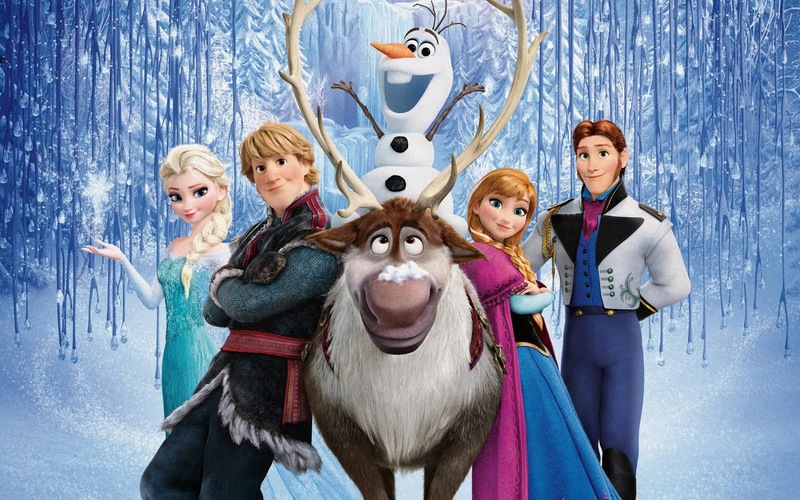 The point of the contest is to make a button with a picture from a Disney film and a quote from another film or song. You can read the original instructions HERE. 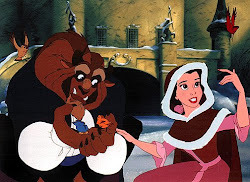 Quote: Shakespeare's "Romeo and Juliet"
Movie: Disney's "Beauty and the Beast"
Song: Rodgers and Hammerstein's "The Sound of Music"
Hi everyone! Just a quick post. I've been working on eBay listings all day and finally have everything done! :) The main reason I'm letting all of you know is that I was able to pick up 2 Madame Alexander Friends Boutique dolls in the after Christmas clearance at Walmart. 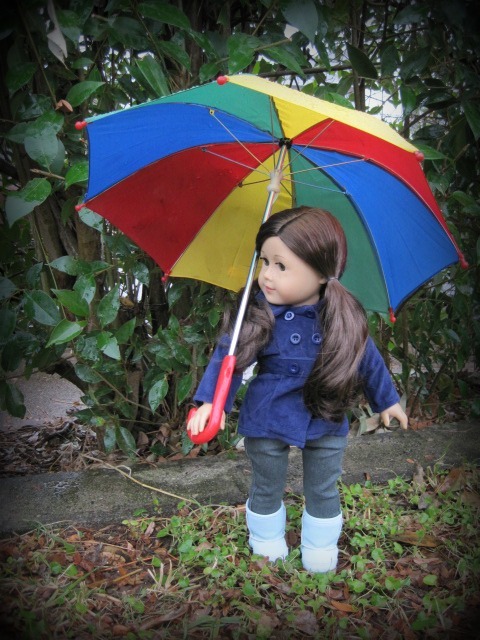 I've had so many of you ask about them, especially Emily (who just happens to be one of the dolls I got! ), that I thought I'd let you know. I'm listing them for the price I bought them for, $16.99 (plus shipping, of course), with no reserve and no buy it now price. My hope is that those of you who missed out on these dolls before Christmas might be able to snag one at a good price now. I also have an American Girl Mini Anniversary Kit doll and some other fun doll and Disney stuff. :) You can view my items for sale HERE. I don't know how much I'll be on this weekend, but I do want to work on some of my promised upcoming posts in the next couple of weeks. I don't like saying I'll do something and then not following through! :} Unfortunately, with my brain the way it is and with all the responsibilities of home, it seems to happen more and more. Congratulations, Emily! You'll be receiving an email from me shortly. Remember, you have 1 week to respond and claim your prize. If I don't hear from you by Saturday, February 4th, then another winner will be chosen. I'm pretty sure that Emily is one of our US entrants, everyone, but if she's not, I'll be sure to let you know. Last Day to Enter the 100,000 Pageviews Giveaway! This is a sad day for many of us in the blogging world. (And no, I'm not talking about SOPA, although I'm a bit concerned by that, too!) I just got an email from Picnik.com last night, explaining that on April 19th, Picnik will be closing. I have loved using Picnik for editing photos, creating headers, and much more. I'm really going to miss it. Along with this sad news comes some happy news for all of you. From now until their closing, Picnik is offering their premium package, normally $24.95 per year, for free! You can make things and save them to your computer for future use, so if you want to have some extra headers or blog buttons on hand, now is the time to do it! The nice thing about Picnik premium is you have many more options for photo collages, fonts, and effects. You also can store somewhere around 100 pictures at a time on Picnik instead of the 5 at a time for their normal free service. The email was somewhat vague, but it kind of sounds like they're merging with Google plus, and it may be possible to transfer photos over from Picnik. Hopefully it won't be too much of a hassle or too expensive! I'll keep you guys updated if I find another site that I like just as well. It's time for a giveaway!! :) I also wanted to celebrate my 100,000 pageviews (although now it's almost 102,000...you guys are awesome!) with a giveaway for my readers. The winner of the giveaway will receive 3 different prizes. :) Please read all the way to the bottom of the post so you don't miss an important update to the giveaway rules! You can see more details about this pattern and its variations HERE on the Debonair Designs blog. Deb will also be listing these actual sweater sets on eBay, so keep an eye on her eBay store! Here's Hayden demonstrating how great this works with your dolls. 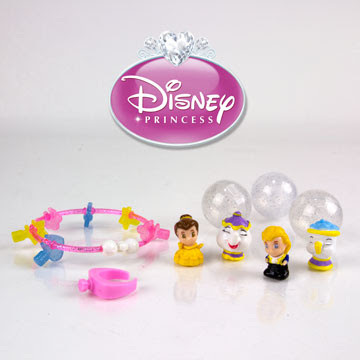 Finally, I'm offering this adorable Tangled Squinkies set. 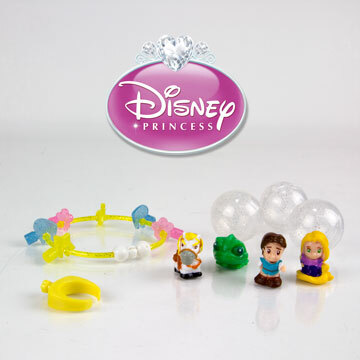 :) The set includes Rapunzel, Flynn, Maximus, Pascal, a bracelet and it's little charm thingees that keep the Squinkies on, and 4 Squinkies bubbles. Here's a closer look at Rapunzel. I just wanted to note that the quality control on this round of Squinkies didn't seem to be that great. This set was the best one I could find that had a good Flynn and a decent Rapunzel. You'll notice that not all of her hair is yellow where it's supposed to be. I just wanted to point this out so you weren't disappointed when she arrived. 1. To enter this giveaway, please leave your name or username and your email address in the comments below. I have comment moderation on, so no one will see your information but me. 2. You may enter the Giveaway until Friday, January 27th. On Saturday, January 28th, I will put all of the entrants' names in a hat and draw the winner. 5. There will be 1 winner...all of the giveaway prizes are going to be given together. 6. The winner of the Giveaway will be notified via email and on this blog. They will have one week to respond and claim their prize. If I don't hear from them by Saturday, February 4th, then another winner will be chosen. 7. I will email the winner the pattern as a PDF file. The Pepsi can and the Tangled Squinkies will be mailed via snail mail. Also, just to let you know, those of you who participate in my Disney Tag will get an extra entry in the Giveaway drawing, just for participating. But hurry! While I don't have a limit on the tag, you will only get a free entry if you participate by Friday, January 27th! 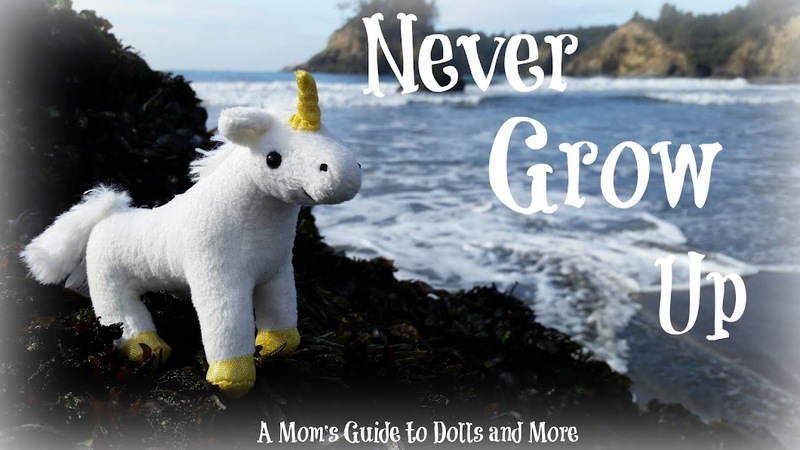 UPDATE: I've had some interest from one of my international readers in the pattern offered in this giveaway, since it doesn't have to be shipped. So, here's what I've decided to do. If you are outside of the US but are interested in the Debonair Designs PDF pattern, you may enter the giveaway. However, I will not be able to ship the Squinkies and soda can to you, so you will be entering for the pattern ONLY. If you are an international reader and enter the giveaway, please let me know in your comment! If I draw the name of someone from outside of the US, I will then hold another drawing for the Squinkies and the soda can. If someone from the US has their name drawn, they will win all 3 items. 1. If you had #1 and #7 over for dinner, what would you serve them and how would you entertain them? 3. #2, #4, and #9 are on a quest. What is the purpose of their quest, and who is the leader? 4. Who would make a better librarian, #3 or #10? 5. It's the final showdown of a Disney film. #7 has to defeat #4. How will he/she do it? 6. #6 is holding a job interview. The interviewees are #9, #3, and #8. What is the job they are interviewing for, and who will get the position? 7. In a sword fight between #1 and #5, who would win? 8. In a musical number, what sort of dance would #10 perform while singing? 9. Who would make a better babysitter, #5 or #2? 10. 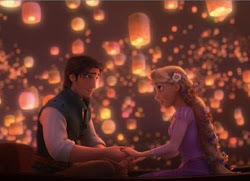 Once upon a time, in a faraway land, #9 dreamed of a different life than the one she/he had. Meanwhile, in another part of the land, #7 and #5 were imprisoned and trying to escape. They were in the clutches of the sinister #2, who refused to show any mercy. One day, #4 passed by the dungeon where #7 and #5 were held captive and heard their cries. Moved with compassion, he/she vowed to not rest until he/she had done everything in his/her power to rescue them. With that, #4 rushed off to get help. The first people (or characters) #4 came across were #1, #6, and #10, who were involved in a street faire. #4 told the others of the plight of #7 and #5, and they were determined to help! They decided to go to the nearest village to get the supplies they would need for such a rescue. The nearest village was, of course, the village where #9 lived. When he/she saw the others so hard at work, #9 asked what they were doing and was told of their quest. Instantly, #9 broke into a spontaneous song, detailing that this was what he/she had been waiting for all of this time. Then #9 joined in their rescue effort. I have some other fun things planned, so be sure to check back! 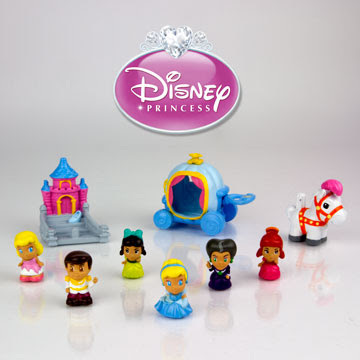 Cinderella's series includes another Prince Charming, Cinderella in her pink ripped dress and blue dress, the Stepmother and Stepsisters, a horse, and the coach and castle for the Squinkies to sit on. 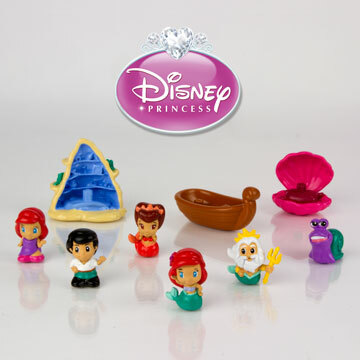 Ariel's new set includes Ariel in mermaid form and in a purple dress (I suppose it's supposed to be the dress her father makes for her when he turns her human again at the end of the movie, but I'm not 100% sure), Prince Eric, Attina, King Triton, and a sea snail. It also has a seashell, a boat, and Ariel's Grotto that are all little things for the Squinkies to sit in. 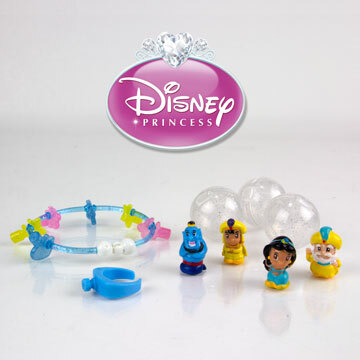 The bracelet set comes with the Genie, Aladdin in his Prince Ali outfit, Jasmine, and the Sultan. 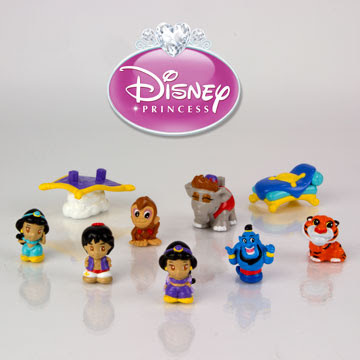 There's also a larger set that comes with 2 different Jasmines, Aladdin in his street clothes, Abu as a monkey and an elephant, Genie, Rajah, the Magic Carpet, and Jasmine's bed. There are also some new regular Squinkies, new Hello Kitty Squinkies, and Squinkies Zinkies, a special variation of Squinkies that are super small (they even come with a pair of plastic tweezers to pick them up!). You can see all of them at the Squinkies.com website HERE. Today, I happened to pop into my favorite thrift store and found a bag of doll-sized clothes marked at $2.50. The clothes were really crammed into the bag and it was stapled shut, so I couldn't see everything that was in there. I did notice one of the little paper American Girl magazines that comes with the My AG dolls and what looked like a bike helmet marked "American Girl", so I figured the clothing should be around the right size. Toys were 25% off today, so I spent $1.88 total. 11. An unmarked t-shirt that reads: "Naples, Florida"
Here's a closer look at the purse and satchel. Both have Velcro closure. This is the handmade floral print dress. It's really cute, especially with the matching bloomers. Here's the lovely colonial dress. This is the jacket part of the replica of Elizabeth's riding set. This is the floral print dress again. Isn't it cute? I love the detail on the bodice. A peek at the matching bloomers (sorry, Hayden!). This dress was not tagged, so I'm assuming it was purchased at a craft fair or made by a family member. Here is Ruthie's Christmas dress. I cannot get over how ADORABLE this is on Hayden!!! I mean, it was nice before, but it looks great on her! A closer look at the detail on the collar. This reminds me a bit of some of the dresses I wore as a little girl, when my mom used to make all of my school dresses. And here is the stunningly beautiful colonial dress. This is nicely made and looks gorgeous on Hayden too! Some of the incredible detail on this dress. I'm sure I would have paid at least $25 for this on Etsy! Here's a closer look at the pretty matching handbag. Finally, here we have the replica of Elizabeth's riding outfit. I actually didn't connect that the skirt went with it until I was trying it on Hayden. Then I realized that the lace trim on both pieces matched. This outfit and the colonial outfit were both tagged "The Doll Clothes Store, Silverton, OR". I looked them up online and found their official website. You can view it HERE. It looks like the colonial dress is no longer available, but this one is still there. Apparently, it originally had a pink over skirt to match the jacket, just like Elizabeth's original outfit from American Girl. 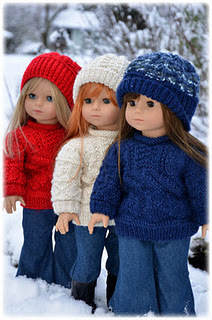 I know some people don't care for handmade items meant to look like the originals from American Girl, but I personally don't have a problem with them, as long as they are advertised as replicas and not originals. I love finding dresses that look like the real deal that are much more affordable! From what I've seen of the clothes I got in this lot, the products from The Doll Clothes Store appear to be well-made using good quality material.